Carolina Reaper Tom Kha Gai Recipe is a popular Thai soup or curry, made with coconut milk and chicken, and flavored with lemongrass, galangal, and chilies. It really focuses on the delicious richness of the coconut milk. 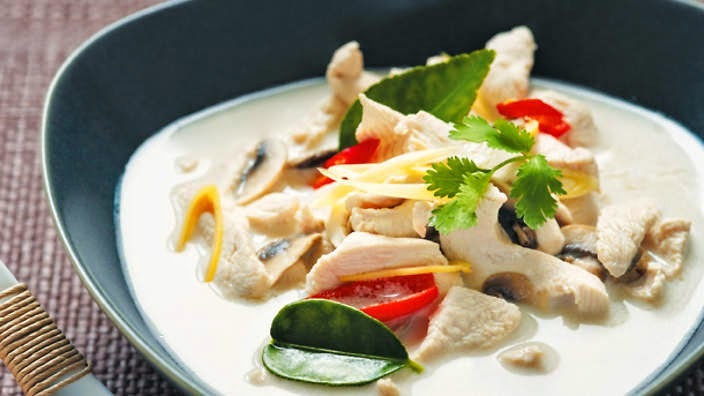 Along with tom yum goong, tom kha gai is one of the most famous Thai dishes. In Thailand, tom kha gai is eaten more like a curry instead of a soup, paired with a plate of rice and spooned onto your rice before eating – so it’s eaten more curry style, and the broth is more like gravy. 1.First take a thumb sized chunk of galangal, cut off the stems, and cut the root part into thin slices. It can be a little tough, so you might have to hit the top of your knife with your palm. 2.Next grab your lemongrass, slice off the bottoms, pull off the outer skin layer, and then slice it diagonally into about 1 inch strips. This is just going to help release its amazing fragrance. 3.Turn on your stove to medium heat, and add about 3 cups (or ½) of the coconut milk to a medium sized saucepan. Put the pot on the heat and immediately toss in the sliced galangal and lemongrass. 4.As your coconut milk begins to heat, move back over to your cutting board and slice up the chicken. I used 2 chicken breasts for this recipe. Slice the chicken into medium sized chunks - they can be kind of big in size. 5.Just before the coconut milk comes to a boil, add the chicken, and then add the other remaining 3 cups of coconut milk. Now, turn down the heat to a medium low, as you don’t want the coconut milk to heat too fast or burn. 6.Prepare your Carolina Reaper Pod chilies by peeling off the stems and then just slice them diagonally. Go ahead and add them directly to the soup. 7.Give the soup a quick stir, and then add about 200 grams of oyster mushrooms (it was about 2 handfuls for me). 8.Your coconut milk should not boil, but just maintain a nice low heat. Because coconut milk is so delicate, when you stir, be sure to move your spoon in 1 direction only, otherwise you run the risk of the coconut milk getting too shaken and it will start to curdle. Be gentle with the coconut milk. 9.Move back over to your cutting board and peel and slice 2 small white onions into thick wedges (if your onion is really big, just use 1). Immediately toss the onions into the soup. 10.Next, cut your tomatoes in the same way as your onions, into thick wedges. Wait until your tom kha gai is just about to boil, and then add the tomatoes. 11.Take the kaffir lime leaves, break them with your hand, and toss them directly into the soup. Breaking the kaffir lime leaves is going to release their flavor. 13.Mix your tom kha gai slowly and gently, for about 5 - 10 minutes, making sure it doesn’t come to a full boil - and if it does - turn down the heat to even lower. You want the chicken, onions, tomatoes, and other ingredients to be fully cooked, but you don’t want to overcook the coconut milk. 14.After about 5 - 10 minutes of cooking, go ahead and turn off the heat completely. 15.Go back to your cutting board, slice up a handful of fresh cilantro, and add it to the soup. Give it a quick stir, and the cilantro will cook enough from the already hot soup. 16.The final step is to juice a couple of limes into a separate bowl and then add about 4 tablespoons of lime juice to the tom kha gai Again, just give it a quick and gentle stir, and it’s ready to be served. 17.Make sure you do some taste-testing to make sure it’s salty and sour enough. You may need to add a little extra salt or lime juice to get the flavor you want. You can also try Trinidad Scorpion chili peppers, Ghost Chili. This will give you different flavors and heat. When you tom kha gai is ready, dish it into a bowl, and serve it with a plate of hot fresh steamed rice. Enjoy! www.firehousechilli.com for all your fiery spicy hot chili peppers.